I saved this recipe on my phone back in February and only just got around to making them earlier this week. Not sure why it took me so long to do it but it was definitely worth the wait. They are very tasty and the cocoa makes you content after only having 1 or 2 so it's the perfect small sweet treat when you are trying to limit the amount of sugar you are having (which is really hard to do by the way). The only thing I would do differently is add a bit more honey as it was a little crumbly. 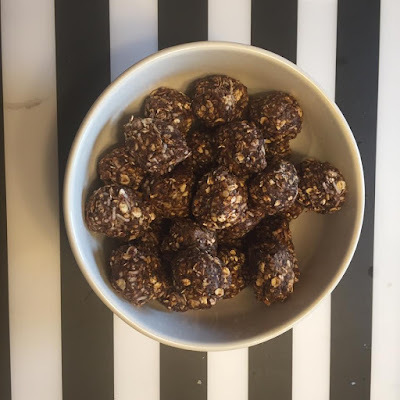 I took the recipe from Gimme Some Oven (link below) and she is one of my favourite food bloggers and she has a plethora of other energy ball recipes but most are too fancy for my picky palet. Stir all ingredients together in a medium bowl until thoroughly mixed. Cover and chill in the fridge for at least a half an hour, to make the mix easier to handle and mold.